Here were my choices: 1) post a portrait; or 2) change the name of this blog to Jandi Small…Daily Painting Addict. My purpose when I first began this blog was to practice my portrait painting and post the stages here…so, to that end, here is the finished portrait of Evan, my son and favorite portrait subject for the last 26-1/2 years. He’s a handsome lad (thank goodness, or it wouldn’t be much fun to paint him) and a gentleman and a scholar. The barn owl in the background symbolizes knowledge and wisdom, both of which Evan has in great quantity. The bamboo branch I painted in his left hand represents luck, protection and good wishes…and I wish for him great good luck and protection all his long life. 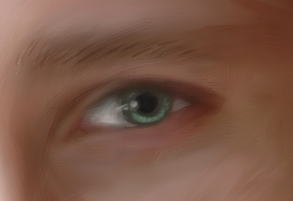 I’m going to try to add a detail from the painting: his left eye. WordPress is somewhat tempermental when it comes to adding multiple images to one post. I’ll see if it works. If you see an eye below, it worked. If not, it didn’t and I’ll make a separate post for it. Eyes are the most fun to paint. Windows of the soul, and all that. 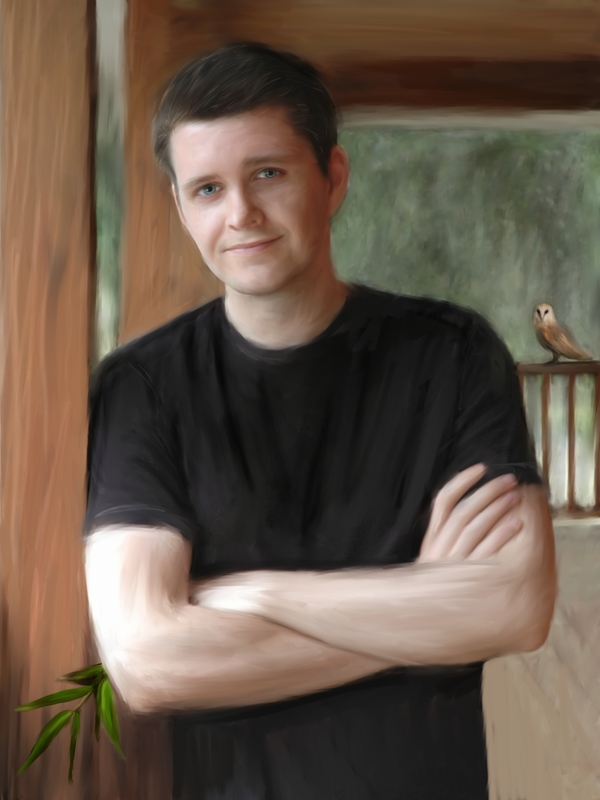 My portrait style is tightly rendered eyes, less tightly rendered facial features…and loose everything else. That keeps, I believe, the viewer’s focus on the face, where it should be. Yes, Evan really does have one blue eye and one green eye. Entry filed under: Portraits in progress. Tags: evan, jandi small, oil painting, portrait.